With my donabe smoker, "Ibushi Gin". 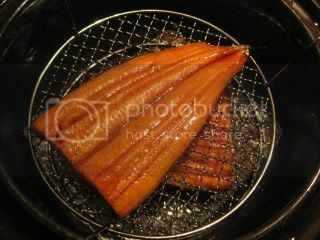 I got packed BBQ eel, and simply smoked it in Ibushi Gin (slightly shorter time than standard procedure). 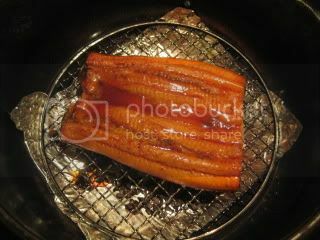 Half of the donabe-smoked BBQ eel was served simply with wasabi (wonderful pairing! ), and for the remaining donabe-smoked BBQ, I made a salad-style dish. I piled some sliced eel with mixture of thinly-sliced cucumber, myoga (ginger bud), and carrot. The salad was lightly seasoned with amazu (1T rice vinegar+1tsp sugar+a pinch of salt) and garnished with some roasted white sesame seeds. Please give me sake.